This silent auction space at the Marriott Washington Wardman Park would have accommodated (with minor tweaking) a flash mob entrance. I’ve enjoyed watching flash mob videos, especially those in New York City where I’m familiar with the venues. Even just two weeks ago I stumbled across a flash mob on Bondi Beach while researching an Australian trip for a charity auction. But I’d never thought of using the concept to seat guests at the auction gala. 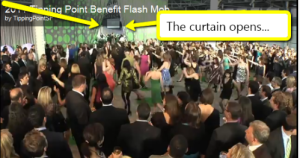 In a June 2011 Chronicle of Philanthropy article, gala guests were encouraged to sit down via the incorporation of a flash mob dance routine during the reception. The organization, Tipping Point in San Francisco, had 900 guests to seat. Staffers and volunteers practiced a dance routine to capture guests’ attention and lead them into the ballroom. A few years ago, I saw something similar while attending an extravagant Middle Eastern-themed ~50-person wedding held in a small museum in Old Town Alexandria. The entire wedding was to die for. One element: When the bride and groom kissed, another show began. A silk curtain parted behind them, a belly dancer emerged, and guests were teased forward into the other half of the museum where food rapidly appeared. It made an impression. My date for the night and I both still talk about the magic of that wedding. I’d suggest that successfully using the flash mob concept at your charity auction requires two elements, in addition to the flash mob itself. First, your venue needs to have a large entryway that dramatically appears to beckon guests forth. 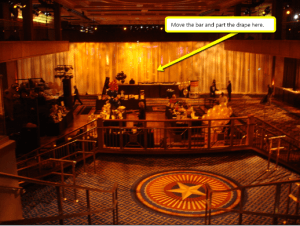 At most of our galas, guests are asked to leave the reception area – which is usually a hotel hallway – and enter the ballroom through multiple sets of double doors. Without the grand entrance, the magic is lost. Second, invest in a great A/V company. The sound needs to be loud. Listen to the video again and think about your own venue. Some groups won’t pay for that quality of audio in the reception area. The bigger your gala, the bigger the action needed. This 900-person event had a 100-person flash mob, great A/V, and a dramatic curtain/entrance. The tiny wedding I attended pulled off a similar concept with one belly-dancer. My advice: Do it right, or don’t do it. What a very cool idea!! Not only would guests enjoy the flash mob, but they’d be talking about it for days, generating more buzz around the event. How fun! Thanks for always sharing such creative and fun suggestions, Sherry.